Marcus Harness, a senior in WSU’s turfgrass management program, is one of 15 students selected from a nationwide pool to participate in the 12th annual United States Golf Association (USGA) Green Section Internship Program. During the one-week internship, Harness will accompany USGA PNW Green Section director Larry Gilhuly (Agronomy-Turf ’75) on turf advisory visits to several golf courses in Oregon. 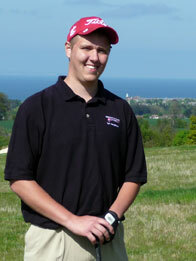 “Normally, a WSU turfgrass management major can expect to intern at two or three golf courses during their course of study” said Matt Williams, WSU turfgrass management academic advisor and former USGA Green Section intern. “With the Green Section Internship Program, Harness will visit seven to ten golf courses within one week. He will gain a much broader perspective of the different types of management practices across a much larger spectrum of courses, from lower budget golf courses to multi-million budget golf courses” explained Williams. A highly respected service of the USGA, turf advisory visits help golf course superintendents produce the best possible course playability while working within the available budget. Green Section agronomists bring a wealth of information and an impartial yet concerned perspective regarding turfgrass growth requirements, how these requirements might best be managed for golf, and ideas other golf courses have found to be beneficial. “The written reports are phenomenal” said Williams. According to Williams, the advisory reports are lengthy and in-depth, and filled with color pictures. They have proven valuable in helping course superintendents track progress toward goals, whether the goal is increased rooting depth or tournament preparation. Outside of this one-week internship Harness will also intern for the Glendale Country Club in Bellevue, Wash.
From Bainbridge Island, Wash, Harness is also a student leader, serving as president of the WSU Turf Club and also undergraduate chapter president of the Theta Chi fraternity at WSU. After he graduates in December of 2009, Harness hopes to one day achieve his career goal of becoming the head superintendent at a golf course.